Cécile Louise Stéphanie Chaminade was born in Paris in 1857 and died in Monte Carlo in 1944. Although she came from a non-musical family she was something of a prodigy as a pianist and composer – she began writing sacred music at the age of eight. It was Bizet who advised Chaminade’s parents that she deserved a sound musical education: as she was unable to enter the Conservatoire (which did not then admit women) she studied privately with several teachers. These included Le Couppey (for piano), Savard (for counterpoint, harmony and fugue); she also studied violin with the celebrated Belgian Martin Marsick, a pupil of Joachim, and composition with Benjamin Godard. Furthermore, she attained proficiency as a conductor, made her concert debut at the age of eighteen, toured widely, and became a well-known public figure, eventually receiving the Légion d’Honneur from the French government. But with the increasing attention being focussed in recent years upon the distinct achievements of women composers, and with belated respect thus accruing to such signally gifted figures as Fanny Mendelssohn, Clara Schumann, Lili Boulanger, Rebecca Clarke and Ruth Crawford, the reputation of Chaminade almost certainly calls out for upward revision. After all, as Norman Demuth perceptively remarks in his study of French piano music – which, if he cannot quite bring himself to intrude her into his main narrative, at least gives Chaminade a little ‘interlude’ chapter to herself – she was ‘nearly a genius in that she knew exactly what, and how, to write for pianists of moderate ability … we wish every writer for the piano had her innate gifts and could be equally musicianly in their own ways’. Demuth also stresses the fact that Chaminade’s music gracefully complements that of Fauré: while she may lack (or scruple to attempt) the latter’s innate profundity, she often matches him in elegance, melodic beauty and lyrical cantabile. It is hardly a criticism that she is usually easier to play. The present anthology of pieces chosen from different periods of Chaminade’s career gives a good indication of her strengths and her characteristic manners. Already in an early work, Chaconne, Op 8, charm vies with an absolutely assured technique. Not that this is any real sense a strict invention on a ground bass, but rather an elegantly generalized evocation of Baroque – the first of several essays in playful archaism, with a few unexpected modulations that anticipate the witty incongruities of Prokofiev’s ‘Classical’ symphony. Or, rather, the cheerful stylistic promiscuity of Poulenc – as becomes clear in Autrefois, a maturer essay in mock-Baroque (this is No 4 of Chaminade’s Pièces humoristiques, Op 87, published in 1897). Here a gentle country-dance tune, with lyrical decoration, contrasts with a brilliant toccata-like middle section featuring some sparkling arpeggio writing. Redolent of quite another age is Callirhoë, an ‘Air de Ballet’ presumably extracted from Chaminade’s orchestral ballet of the same name. I have been unable to establish whether the scenario relates to the mythological Callirhoë, the wife of Alcmaeon, whose lover Zeus caused her infant sons to grow instantly into men to avenge her husband’s murder; or Callirhoë the virgin of Calydon, who was vainly wooed by a Priest of Dionysus. Nor does it matter: the piano piece clearly has nothing to do with Ancient Greece. This is a giddy little polka in G major, not far removed from the atmosphere of the Folies bergères – yet also an instance of exploratory pianism, taking over Liszt’s notational innovation of two notes on a single bifurcated stem to accommodate the giggling crushed semitones which so naughtily spice up the harmony. An altogether more poetic and contemplative mood is struck by Solitude, the second of Chaminade’s Op 127 Poèmes provençales: a serenely singing piece with a gently pulsing chordal accompaniment, though the prevalence of two-bar phrases perhaps robs its principal melody of real distinction. Similar in technique, but more impressive, is the Romance in D of 1910, whose syncopated chordal accompaniment more effectively sustains the tension of a very Fauréan, ambiguously troubled main idea. L’Ondine, Op 101, published in 1900, is a little tone-picture of the eponymous water nymph – and of course very unlike Ravel’s tour de force of tenebrous virtuosity in Gaspard de la nuit. Here an enchanting tune is borne upon a rippling accompaniment which develops into a middle section of glittering, veloce liquid arpeggios, whose watery motion eventually forms the coda of the piece. Two pieces follow from Chaminade’s first set of Études de concert, Op 35. The Scherzo in C major is a cheerful invention in quick waltz time with occasional tinkling musical-box effects and some touches of Hungarian gypsy colour. Its companion Automne, however, is a more exalted utterance. Not undeservedly, this spacious study in D flat is Chaminade’s most famous piece. 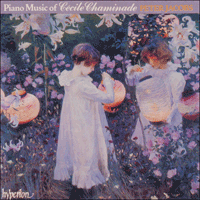 Essentially this is a full-blown example of the Romantic étude in the Chopin–Liszt tradition, but viewed from a perspective that includes the early Fauré nocturnes. The songful main theme, supported by a full yet delicate keyboard texture, evokes autumnal peace and melancholy, while stormy weather invades the con fuoco central section which rises to heights of fierce Lisztian passion before subsiding once more. Chaminade’s Thème varié, Op 89 in A major, is a short, informal set of variations – essentially decorative elaborations of a lilting, mock-classical tune. There are chiming effects, and two A minor variations with sonorous arpeggio writing. At the end the arpeggio decoration entwines with a partial reprise of the theme. Even simpler is the Sérénade in D, Op 29: an innocent tune treated to some deft modulations to vary its even, untroubled flow. Two items come from the Romances sans paroles, Op 76, published in 1893. Souvenance (‘Remembrance’) is a poised B minor song of elegant melancholy and disquiet. Its E major companion Élévation (‘Exaltation’) is, on the other hand, the kind of piece which gave Chaminade a reputation as a purveyor of overwhelming sentimentality: Demuth calls it ‘dreadful’. Certain kinds of performance might indeed conjure only sententious rhetoric from its richly harmonized and somewhat religiose main idea, but interpreted with warmth and restraint the piece emerges as a glowing example of innocent late-Romantic idealism. Two pieces from the comparatively late second set of Études de concert display Chaminade’s skilful despatch of stylistic and technical challenges. The Étude mélodique in G flat, Op 118, is charmingly songful in rather Schumannesque vein, much of the interest generated by a rippling inner voice in triplets – but its scope enlarges as it proceeds and rises to an unexpectedly powerful climactic episode in F sharp minor. The Étude pathétique in B minor, Op 124, is, as its title implies, a much more agitated affair: impassioned, vehement, even tragic, chromatically inflected (and afflicted), with grand gestures and dramatic alternations of tempo. But as a piece of rhodomontade it is carried off with fine style. An altogether simpler inspiration is La lisonjera (‘The flatterer’), a kind of witty serenade in D flat. Its capricious melody displays some Spanish turns of phrase, and indeed the work makes an agreeable parallel to Debussy’s La sérénade interrompue. This collection includes two contrasting waltzes, both in A major (which seems to have been one of Chaminade’s favourite keys) – the second and seventh that she published. The Deuxième valse, Op 77, is salon music at its best – a delicately lilting fast waltz, very redolent of Chopin, almost breathless as it swirls around the ballroom and wittily self-intoxicated with its own melodic gaiety. The later Valse romantique, Op 115, is by contrast a large-scale concert waltz with a richer harmonic palette and a vigorous elegance that suggests Chabrier (compare his own Valses romantiques for piano duet). After an agitated A minor middle section, the waltz becomes steadily more brilliant and virtuosic as it approaches its end. The sway of boats in Pêcheurs de nuit (‘Fishermen at night’, another of the Poèmes provençales) evokes, as is apposite, a species of barcarolle. This is one of Chaminade’s finest pieces. Its sinuous E minor main tune accumulates a sinister melancholy which makes one wonder if she knew the barcarolles of Alkan, while powerful deep tolling E’s suggest the beat of distant surf. A more confident and heroic middle section in B major becomes steadily more dramatic, and after the return of the opening idea the waters finally close over it in swirling arpeggio figuration. Finally, Chaminade’s Étude scholastique, Op 139, published in 1910, re-visits the archaic manner of the early Chaconne from a viewpoint of absolute maturity. ‘Scholastique’ does not mean academic, but her vigorous free invention in the Baroque manner takes a dig at the kind of strict stylistic imitation required by the conservatoires. Actually the piece is a brilliant toccata in A minor. The time signature is 2/4, but the fast triplets give it the feeling of a gigue. A broad, richly chordal subsidiary theme in C major hints at Brahmsian, even Elgarian models – but this is soon wreathed in very un-Brahmsian arpeggio writing. When this idea eventually returns it is in the tonic major, and in A major, with a fine flourish, the Étude scholastique concludes – a convincing demonstration of the powers of a composer who, within her chosen sphere, attained a frequent and diverting excellence. Cécile Louise Stéphanie Chaminade naquit à Paris en 1857 et mourut à Monte Carlo en 1944. Issue d’une famille non musicale, elle se révéla une pianiste et compositeur prodige, quand elle commença à composer de la musique religieuse à huit ans. C’est Bizet qui persuada ses parents qu’elle méritait de recevoir une solide éducation musicale: comme il ne lui était pas possible d’entrer au Conservatoire (qui ne recevait pas les femmes à cette époque) elle étudia avec plusieurs professeurs privés. Parmi ceux-ci se trouvaient Le Couppey (pour le piano), Savard (pour le contrepoint, l’harmonie et la fugue); elle étudia aussi le violon avec le célèbre musicien belge Martin Marsik, élève de Joachim, et la composition avec Benjamin Godard. Elle devint également un excellent chef d’orchestre, débutant à dix-huit ans, fit de grandes tournées, et devint une personnalité bien connue; elle reçut finalement la Légion d’Honneur du gouvernement français. Pendant sa longue vie, Chaminade produisit environ 350 ouvrages, dont un opéra-comique, un ballet, une symphonie chorale Les amazones, de la musique de chambre et d’orchestre et environ une centaine de chansons. Mais c’est dans le domaine du court morceau de musique lyrique pour piano qu’elle excellait et pour lequel elle composa le plus d’ouvrages dont plusieurs devinrent très populaires. Elle leur dût un considérable succès commercial et une grande renommée en France, en Grande-Bretagne et aux Etats-Unis. Ces morceaux alimentaient un marché pour musiciens de salon ou ceux qui simplement jouaient en famille et qui ne voulaient ni profondeur ni complexité de pensée mais répondaient à une gracieuse mélodie, de simples formes, de nettes textures et une exploitation adroite et sincère du genre; une musique qui, avec sa «vélocité facile», était souvent conçue pour paraître plus difficile qu’elle ne l’était en réalité. Mais l’attention qui se fixe de plus en plus, depuis quelques années, sur les réussites particulières de compositeurs féminins et le respect tardif que l’on accorde ainsi à des personnalités aussi douées que Fanny Mendelssohn, Clara Schumann, Lili Boulanger, Rebecca Clarke et Ruth Crawford, font qu’une révision positive de la réputation de Cécile Chaminade ne peut plus attendre. Après tout, comme Norman Demuth le remarque avec perception dans son étude de la musique française pour piano – dans laquelle, même s’il ne peut arriver à l’inclure dans son texte principal, il accorde au moins un petit chapitre «intermède» à Chaminade – elle savait «d’une manière presque géniale exactement quoi et comment composer pour des pianistes de compétence modérée … nous souhaitons que tous les compositeurs pour piano aient son talent inné et puissent à leur façon avoir un sens égal de la musique». Demuth souligne aussi le fait que la musique de Chaminade complémente avec grâce celle de Fauré: peut-être lui manque-t-il (ou se fait-elle scrupule de tenter d’imiter) la profondeur innée de ce dernier, mais elle est souvent son égale en élégance, beauté mélodique et cantabile lyrique. On ne peut guère accepter que dire qu’elle est souvent plus facile à jouer soit une critique. La présente anthologie de morceaux, choisis dans différentes périodes de la carrière de Chaminade donne un bon aperçu de ses points forts et de ses caractéristiques. Chaconne, opus 8, qui est une de ses premières œuvres, montre un charme qui rivalise avec une technique d’une assurance absolue. Ce n’est pas strictement une réelle invention sur une basse contrainte mais plutôt une évocation élégamment généralisée de Baroque – le premier de plusieurs essais en archaïsme enjoué, avec quelques modulations inattendues qui devancent les incongruités spirituelles de la Symphonie «Classique» de Prokofiev. Ou plutôt, la joyeuse promiscuité stylistique de Poulenc – comme l’illustre Autrefois, un essai d’une plus grande maturité en imitation Baroque (c’est le no4 des Pièces humoristiques de Chaminade, opus 87, publié en 1897). Dans ce morceau, un air léger de danse campagnarde, avec une décoration lyrique, contraste avec une brillante section centrale aux airs de toccata avec d’étincelants passages d’arpèges. Callirhoë, évocateur d’un autre âge, est un «Air de Ballet» qui provient probablement du ballet orchestral de Chaminade du même nom. Je n’ai pas pu découvrir si le scénario se rapporte à la Callirhoë mythologique, femme d’Alcmaeon, dont l’amant Zeus transforma sur le champ les fils nouveau-nés en hommes pour venger le meurtre de son mari; ou bien Callirhoë, vierge de Calydon, dont un Prêtre de Dionysos rechercha en vain les faveurs. Cela n’a d’ailleurs pas d’importance: le morceau de musique n’a manifestement rien à voir avec la Grèce Ancienne. C’est une légère petite polka en sol majeur, dont l’atmosphère est assez proche de celle des Folies bergères – et pourtant aussi un exemple de pianisme exploratif, reprenant l’innovation de Liszt de deux notes sur une seule tige à deux branches pour recevoir les demi-tons serrés dont les rires étouffés pimentent si malicieusement l’harmonie. Dans Solitude, nous trouvons une humeur beaucoup plus poétique et contemplative; c’est le second des Poèmes provençales, opus 127, de Chaminade; un petit morceau poétique avec un accompagnement d’accords au rythme léger, bien que la fréquence de phrases à deux mesures ne prive sa mélodie principale de réelle distinction. La Romance en ré, de 1910, est de même technique mais plus frappante; son accompagnement d’accords syncopés soutient de manière plus effective la tension d’une idée principale très Fauréenne, à la préoccupation ambigüe. L’Ondine, opus 101, qui fut publiée en 1900, est un petit portrait symphonique de l’éponyme nymphe des eaux – et bien sûr, très différent du tour de force de virtuosité ténébreuse de Ravel, dans Gaspard de la nuit. Dans le morceau de Chaminade, un air charmant porté par un accompagnement ondulant qui se développe en une section centrale de scintillants et limpides arpèges veloce, dont le mouvement liquide forme la coda du morceau. Viennent ensuite deux morceaux extraits de la première série d’Études de concert, opus 35. Le Scherzo en ut majeur est une joyeuse invention en temps de valse rapide avec, de temps en temps, des effets de tintement de boîte à musique et quelques touches de couleur tsigane hongroise. Cependant, son compagnon, Automne, est plus important. Cette ample étude en ré bémol mérite d’être le morceau le plus célèbre de Chaminade. C’est essentiellement un exemple parfait de l’étude romantique dans la tradition Chopin–Liszt, mais à laquelle s’ajoutent les premiers nocturnes de Fauré. Le thème principal mélodieux est soutenu par une complète texture de clavier qui reste pourtant délicate, et évoque la paix et la mélancolie de l’automne, tandis que le temps orageux envahit la section centrale con fuoco qui s’élève jusqu’à des sommets de passion Lisztiens avant de s’apaiser de nouveau. Le Thème varié, opus 89, en la majeur, est une série courte et simple de variations – des élaborations essentiellement décoratives d’un air cadencé, imitant le classique. Il y a des effets carillonnants, et deux variations en la mineur avec une forte écriture d’arpèges sonores. À la fin, une reprise partielle du thème s’entrelace dans l’élaboration d’arpèges. La Sérénade en ré, opus 29, est encore plus simple; un air innocent auquel sont données quelques prestes modulations pour varier son cours tranquille et régulier. Les deux morceaux suivants sont tirés des Romances sans paroles, opus 76, publiées en 1893. Souvenance est une chanson pleine d’assurance en si mineur, qui exprime avec élégance mélancolie et inquiétude. Son compagnon en mi mineur Élévation est par contre un bon exemple du genre de morceau qui a donné à Chaminade sa réputation de compositeur d’embarrassante sentimentalité; Demuth le qualifie «d’affreux». Certaines interprétations pourraient, en effet, n’évoquer qu’une rhétorique sententieuse de son thème principal, qui a de riches harmonies et une certaine religiosité; mais s’il est joué avec chaleur et discrétion, le morceau apparaît comme un brillant exemple d’innocent idéalisme de la fin du romantisme. Deux morceaux des Études de concert, une seconde série relativement tardive, montre l’habile et prompt traitement que Chaminade réservait aux défis techniques et de style. L’Étude mélodique en sol bémol, opus 118, est délicieusement poétique, d’un style plutôt Schumannesque – une cascadante voix intérieure en triolets crée la plus grande partie de son attrait – mais comme elle progresse, elle se développe et s’élève jusqu’à un épisode culminant d’une force surprenante en fa dièse mineur. L’Étude pathétique en si mineur, opus 124, est, comme le titre l’indique, un morceau beaucoup plus tourmenté: passionné, véhément, même tragique, infligé (et affligé) chromatiquement de nobles gestes et de dramatiques alternances de tempo. Mais c’est un exemple de fanfaronade enlevé avec le plus grand style. La lisonjera («La flatteuse») est d’inspiration beaucoup plus simple, une sorte de sérénade spirituelle en ré bémol. On trouve dans sa mélodie capricieuse quelques tours de phrase espagnols, et le morceau est en fait un parallèle agréable à La sérénade interrompue de Debussy. Cette série comprend aussi deux valses contrastantes, toutes deux en la majeur (qui semble avoir été un des tons préférés de Chaminade) – la deuxième et la septième qu’elle a publiées. La Deuxième valse, opus 77, est de la meilleure musique de salon – une valse rapide, délicatement cadencée, qui rappelle beaucoup Chopin, tourbillonnant presque hors haleine autour de la salle de bal et spirituellement à demi-enivrée par sa gaieté mélodique. La Valse romantique, opus 115, écrite plus tard, est par contraste une valse de concert plus importante, à la palette harmonique plus riche et avec une élégance vigoureuse qui fait penser à Chabrier (comparez ses propres Valses romantiques pour piano à quatre mains). Après une section centrale tourmentée en la mineur, la valse devient progressivement plus brillante et plus virtuose comme elle arrive à sa fin. Le balancement de bateaux dans Pêcheurs de nuit (un autre extrait des Poèmes provençales) évoque, comme il convient, une sorte de barcarolle. C’est une des plus beaux morceaux de Chaminade. Son air principal ondulant en mi mineur concentre une mélancolie sinistre qui nous mène à nous demander si elle connaissait les barcarolles d’Alkan, alors que le glas profond du mi fait penser au battement des vagues déferlantes. Une partie centrale plus assurée et héroïque en si majeur devient progressivement plus dramatique, et après le retour du thème de l’introduction, les eaux se referment dessus en une figuration tourbillonnante d’arpèges. Finalement, l’Étude scholastique de Chaminade, opus 139, publiée en 1910, retourne à la manière archaïque de Chaconne, mais la traite d’une manière de très grande maturité. «Scholastique» ne signifie pas académique, mais son invention libre et vigoureuse à la manière baroque donne au passage un coup de griffe à la sorte de stricte imitation stylistique qu'exigeaient les conservatoires. En fait, le morceau est une brillante toccata en la mineur. Le chiffrage des mesures est 2/4, mais les rapides triolets lui donnent un air de gigue. Un thème auxiliaire ample et aux riches accords en ut major évoque des modèles Brahmsiens ou même Elgariens – mais il est très rapidement enveloppé d’une écriture d’arpèges qui n’a rien de Brahms. Quand ce thème revient enfin, c’est dans le tonique majeur, et c’est en la majeur, avec une belle fioriture, que l’Étude scholastique se termine – donnant une démonstration convaincante du talent d’un compositeur qui fait souvent preuve dans son domaine choisi, d’une excellence divertissante. Cécile Louise Stéphanie Chaminade wurde 1857 in Paris geboren und starb 1944 in Monte Carlo. Obwohl sie einer Familie ohne musikalischen Hintergrund entstammte, war sie als Pianistin und Komponistin so etwas wie ein Wunderkind – sie begann mit acht Jahren Kirchenmusik zu schreiben. Es war Bizet, der den Eltern Chaminade riet, ihr eine solide musikalische Ausbildung angedeihen zu lassen: Da sie nicht das Conservatoire besuchen konnte (das damals keine Frauen zuließ), nahm sie Privatunterricht bei mehreren Lehrern, darunter Le Coupey (Klavier) und Savard (Kontrapunkt, Harmonielehre, Fuge); außerdem studierte sie Violine bei dem berühmten Belgier Martin Marsick, einem Schüler von Joseph Joachim, und Komposition bei Benjamin Godard. Darüber hinaus übte sie sich als Dirigentin, gab mit 18 Jahren ihr Konzertdebüt, unternahm ausgedehnte Tourneen und wurde zur bekannten Figur des öffentlichen Lebens, die schließlich von der französischen Regierung die Auszeichnung Légion d’Honneur erhielt. Im Verlauf ihres langen Lebens schuf Cécile Chaminade rund 350 Werke, darunter eine komische Oper, ein Ballett, eine Chorsinfonie mit dem Titel Les amazones, Orchester- und Kammermusik sowie ungefähr hundert Lieder. Doch das Gebiet, auf dem sie sich besonders auszeichnete und am produktivsten war, ist das kurze lyrische Klavierstück. Von diesen waren viele äußerst populär und trugen ihr erheblichen kommerziellen Erfolg in Frankreich, Großbritannien und den USA ein. Sie bediente den Markt für häusliches Musizieren und Salonmusik, der für Tiefgründigkeit oder gedankliche Komplexität nichts übrig hatte, aber elegante Melodik, schlichte Formen, klare Strukturen und gekonnte, dankbare Umsetzung des Mediums zu schätzen wußte: Musik, die dank ihrer mühelosen Geläufigkeit häufig darauf angelegt war, schwieriger zu klingen, als sie in Wahrheit ist. Da jedoch in den letzten Jahren dem eigenständigen Schaffen von Komponistinnen zunehmende Aufmerksamkeit gewidmet und damit einmalig begnadeten Frauen wie Fanny Mendelssohn, Clara Schumann, Lili Boulanger, Rebecca Clarke und Ruth Crawford später Respekt gezollt wird, ist es sicherlich an der Zeit, das Ansehen von Cécile Chaminade aufzuwerten. Schließlich bemerkt Norman Demuth scharfsichtig in seiner Studie zur französischen Klaviermusik – obwohl er sich nicht dazu durchringen kann, sie in den Hauptstrang seiner Darstellung aufzunehmen, widmet er ihr doch ein kurzes Zwischenkapitel – sie sei „insofern fast genial, daß sie genau wußte, was und wie es für Pianisten von bescheidenem Können zu schreiben galt … man wünscht sich, daß alle Klavierkomponisten ihre angeborene Gabe hätten und auf ihre Art mit ebenso hoher Musikalität gesegnet wären wie sie“. Außerdem betont Demuth, daß Cécile Chaminades Musik die von Fauré angenehm ergänzt: Zwar fehlt ihr die ihm eigene Tiefgründigkeit (oder sie schreckt davor zurück), doch kommt sie ihm oft an Eleganz, Schönheit der Melodie und lyrischem Cantabile gleich. Daß sie oft leichter zu spielen ist, kann man ihr wohl kaum ankreiden. Die vorliegende Zusammenstellung von Stücken aus verschiedenen Epochen der Laufbahn von Cécile Chaminade vermittelt einen guten Einblick in ihre Stärken und charakteristischen Merkmale. Bereits in einem frühen Werk, der Chaconne Op. 8, wetteifert Charme mit vollkommen sicherer Technik. Dieses Werk ist keine wirklich strenge Invention über einem Generalbaß, sondern eine elegant verallgemeinerte Beschwörung des Barock – der erste von mehreren Versuchen in spielerischer Archaik, mit einigen unerwarteten Wendungen, die auf die geistreichen Stilbrüche in Prokofjews „Klassischer“ Sinfonie vorausblicken. Oder vielmehr auf die unbeschwerte Stilvielfalt Poulencs – das wird bei Autrefois deutlich, einem reiferen Versuch der Nachahmung des Barock (es handelt sich dabei um die Nr. 4 von Cécile Chaminades 1897 veröffentlichten Pièces humoristiques, Op. 87). Hier wird eine liebenswert ländliche Tanzmelodie mit lyrischer Verzierung einem brillanten Mittelteil nach Art einer Toccata gegenübergestellt, der sich durch einige glänzend umgesetzte Arpeggien auszeichnet. An ein ganz anderes Zeitalter gemahnt Callirhoë, ein „Air de Ballet“, das vermutlich aus Cécile Chaminades gleichnamigem Orchesterballett stammt. Ich habe nicht feststellen können, ob sich das Szenarium auf die mythologische Callirhoë bezieht, die Gattin des Alcmaeon, deren Liebhaber Zeus ihre neugeborenen Söhne augenblicklich in erwachsene Männer verwandelte, die den Mord an ihrem Gatten rächen konnten; oder auf Callirhoë, die Jungfrau von Calydon, die vergeblich von einem Dionysospriester umworben wurde. Aber das macht nichts: Das Klavierstück hat eindeutig nichts mit dem griechischen Altertum zu tun. Es ist eine schwindelerregende kleine Polka in G-Dur, deren Atmosphäre an die Folies bergères erinnert – und zugleich ein Fall von pianistischer Exploration, die Liszts notenschriftliche Neuerung zweier Noten an einem einzigen gegabelten Hals übernimmt, um den kichernden, dicht gedrängten Halbtönen gerecht zu werden, die so frivol die Harmonik würzen. Erheblich poetischere, besinnlichere Stimmung schafft Solitude, das zweite der Poèmes provençales, Op. 127, von Cécile Chaminade: ein heiter sangliches Stück mit sanft pulsierender Akkordbegleitung, auch wenn die vorherrschenden zweitaktigen Phrasen das Hauptmotiv möglicherweise wahrer Größe berauben. Technisch ähnlich, aber eindrucksvoller ist die 1910 entstandene Romanze in D-Dur, deren synkopierte Akkordbegleitung effektiver die Spannung eines stark an Fauré orientierten, vieldeutig verstörten Hauptthemas aufrechterhält. L’Ondine, Op. 101, im Jahr 1900 veröffentlicht, ist ein kleines Tongemälde der im Titel genannten Wassernymphe – und natürlich ganz anders geartet als Ravels Tour de force finsterer Virtuosität in Gaspard de la nuit. Hier wird eine zauberhafte Melodie auf plätschernder Begleitung davongetragen, aus der sich ein Mittelteil funkelnder, veloce bezeichneter, flüssiger Arpeggien ergibt, deren strömende Bewegung schließlich die Coda des Stücks bildet. Es folgen zwei Stücke aus Cécile Chaminades erster Zusammenstellung von Études de concert, Op. 35. Das Scherzo in C-Dur ist eine fröhliche Invention im schnellen Walzertakt mit gelegentlichen klimpernden Spieluhreffekten und Anklängen ungarischer Zigeunerklänge. Das andere Stück, Automne, sagt dagegen Erhabeneres aus. Nicht umsonst ist diese umfangreiche Etüde in Des-Dur Cécile Chaminades bekanntestes Werk. Im Grunde genommen handelt es sich dabei um ein ausgewachsenes Exemplar der von Chopin und Liszt überlieferten romantischen Etüde, wenn auch aus einer Perspektive betrachtet, welche die frühen Nocturnes von Fauré einbezieht. Das melodiöse Hauptthema, gestützt auf ein dichtes, aber feines pianistisches Gefüge, beschwört herbstlichen Frieden und Melancholie herauf, während stürmisches Wetter in den con fuoco bezeichneten zentralen Abschnitt einzieht, der sich zu heftiger Lisztscher Leidenschaft steigert, ehe er wieder verklingt. Cécile Chaminades Thème varié, Op. 89, in A-Dur ist eine kurze, zwanglose Folge von Variationen – im wesentlichen dekorative Verarbeitungen einer trällernden pseudoklassischen Melodie samt Glockeneffekten und zwei klangvoll arpeggierenden a-Moll-Variationen. Am Ende verbindet sich die Arpeggioverzierung mit einer teilweisen Reprise des Themas. Noch schichter ist die Serenade in D-Dur, Op. 29: eine unschuldige Weise, die einige geschickte Modulationen erfährt, um ihr gleichmäßiges, ungetrübtes Fließen abwechslungsreicher zu gestalten. Zwei Programmpunkte entstammen den 1893 veröffentlichten Romances sans paroles, Op. 76. Souvenance („Besinnung“) ist ein gelassenes Lied in h-Moll, erfüllt mit eleganter Melancholie und Unruhe. Élévation („Erhebung“) andererseits, das Gegenstück in E-Dur, gehört zu jenen Werken, die Cécile Chaminade den Ruf eingetragen haben, überwältigende Sentimentalität zu vermitteln: Demuth nennt es „gräßlich“. Es mag sein, daß gewisse Formen der Darbietung seinem üppig harmonisierten, irgendwie frömmelnden Hauptmotiv in der Tat nur salbungsvolle Rhetorik entlocken, doch wenn es mit Wärme und Zurückhaltung interpretiert wird, erweist sich diese Komposition als glänzendes Beispiel für unschuldigen spätromantischen Idealismus. Zwei Stücke aus der relativ spät entstandenen zweiten Zusammenstellung von Études de concert demonstrieren Cécile Chaminades geschickte Bewältigung stilistischer und technischer Herausforderungen. Die Étude mélodique, Op. 118, in Ges-Dur ist reizvoll melodiös mit starken Anklängen an Schumann und wird insbesondere durch eine in Triolen geführte plätschernde innere Stimme interessant – doch schwillt das Stück im weiteren Verlauf an und steigert sich zu einem unerwartet kraftvollen Höhepunkt in fis-Moll. Die Étude pathétique in h-Moll Op. 124 ist, wie schon der Titel nahelegt, eine wesentlich erregtere Angelegenheit: leidenschaftlich, hitzig, ja sogar tragisch, chromatisch angehaucht (und belastet), mit großartigen Gesten und dramatischen Tempowechseln. Doch als Rodomontade wird das Stück in glanzvollem Stil bewältigt. Eine weitaus schlichtere Eingebung ist La lisonjera („Die Schmeichlerin“), eine Art geistreicher Serenade in Des-Dur. Ihre kapriziöse Melodie zeichnet sich durch einige spanische Wendungen aus, wie auch das ganze Werk eine durchaus liebenswerte Parallele zu Debussys Sérénade interrompue abgibt. Die vorliegende Auswahl umfaßt zwei kontrastierende Walzer in A-Dur (wie es scheint, eine der Lieblingstonarten von Cécile Chaminade) – und zwar den zweiten und siebten der Reihe, die sie veröffentlichte. Der Deuxième valse, Op. 77, ist allerbeste Salonmusik – ein feinfühlig beschwingter schneller Walzer, der stark an Chopin erinnert, regelrecht atemlos von seinem Wirbeln rund um den Ballsaal und auf witzige Art berauscht durch seine ureigene melodische Fröhlichkeit. Der spätere Valse romantique, Op. 115, ist dagegen ein großangelegter Konzertwalzer mit reicherer harmonischer Palette und einer kraftvollen Eleganz, die auf Chabrier hindeutet (man vergleiche seine Valses romantiques für Klavier zu vier Händen). Nach einem erregten Mittelteil in a-Moll nimmt der Walzer stetig an Brillanz und Virtuosität zu, während er sich seinem Ende nähert. Das Schwanken der Boote in Pêcheurs de nuit („Fischer bei Nacht“), einem weiteren Poème provençale, ruft treffenderweise eine Art Barkarole hervor. Dies ist eine der besten Kompositionen von Cécile Chaminade. Ihr geschmeidiges Hauptmotiv in e-Moll staut eine düstere Melancholie auf, die dazu führt, daß man sich fragt, ob ihr die Barkarolen von Alkan bekannt waren, und gleichzeitig deuten mächtige dunkel schallende Es das ferne Rauschen der Brandung an. Ein zuversichtlicher heroischer Mittelteil in B-Dur nimmt unaufhörlich an Dramatik zu, und nachdem das einleitende Motiv wiedergekehrt ist, wird es endgültig in wirbelnder Arpeggiofiguration vom Wasser verschlungen. Zu guter letzt greift Cécile Chaminades 1910 veröffentlichte Étude scholastique, Op. 139, vom Standpunkt absoluter Reife auf die archaische Manier der frühen Chaconne zurück. „Scholastique“ bedeutet nicht etwa „akademisch“, sondern ihre lebhafte freie Invention im Stil des Barock liefert gerade einen Seitenhieb gegen jene Art strenger stilistischer Imitation, wie sie an den Konservatorien verlangt wird. Im Grunde ist das Stück eine brillante Toccata in a-Moll. Die Taktangabe lautet 2/4, doch die schnellen Triolen vermitteln das Gefühl einer Gigue. Ein breit angelegtes, von üppigen Akkorden bestimmtes Seitenthema in C-Dur deutet auf Vorbilder wie Brahms oder gar Elgar hin – doch wird es bald von Brahms gänzlich fremden Arpeggien überdeckt. Wenn dieses Motiv schließlich wiederkehrt, steht es in der Dur-Tonika, und in A-Dur endet die Étude scholastique mit einem großartigen Schnörkel – eine überzeugende Demonstration der Fähigkeiten einer Komponistin, die in ihrem Rahmen oft Hervorragendes zu leisten vermochte.